I had some PM conversation with @JerEvil recently where he asked for help setting up reamping in mixcontrol. I know this has been a source of frustration for many users, so I ended up writing a novel, where I tried to explain in detail and in a what I hoped was a fairly understandable language. I want everyone to be able to read it, and plan to put it in my signature for easy answering of questions, so I'll include it here. What I hope you guys will do is to read it and tell me what is unclear (referring to specific points, please!). It's not perfect at the moment, so this is a starting point for refinement. I assume that you know how you get kemper to pick up the signal, and your question is only on the computer/DAW/interface side of things. I use SPDIF, but the general process should be the same. 1) Let's assume that you record like me, which is to a stereo track, where the DI signal is on the left, and the "amp" signal is on the right. 3) I achieve this by putting a gain plugin first in the chain. Inside this, there is the pan knob, which allows me to hear only the right side of the recorded track (the amped side) or the left side (the DI part of the track). Or any blend, but that's rarely interesting! So turning the pan knob INSIDE THE PLUGIN all the way to the right, I now have only the right side playing - that is: only the amped signal (unlike the picture, where it was setup for reamping, and thus turned to the other side - the principle is exactly the same). 4) that gain plugin pan/balance setting means that I have the "amp" signal playing in the right side only. That's not very helpful. So I engage the "mono" button, which then makes the signal after that internal pan pot MONO. This puts it right in the center. This means that I, during playback, can pan it from there to wherever I want - left, right, center, whatever. On a mono track, a pan pot works as a pan pot - panorama, moving the track across the stereo field from left to right etc etc. On a stereo track, a pan pot works as a BALANCE CONTROL - i.e. left/right balance. how loud is the right side of the signal as opposed to the left side. (technically, the pot does exactly the same whether it is a stereo track or mono track, it is simply a pot that progressively turns down the volume of the side you're turning it away from). This means that inside the gain plugin, I use it to balance left to right such that there is 0% left side signal and 100% right side signal. Monoing inside the plugin then adds the left side signal and the right side signal and puts it in the middle. Since there is no signal in the left side, the net result is you get 100% right side, but now in the middle. This effectively means that AFTER THAT GAIN PLUGIN with those settings, the track essentially behaves like it was a single mono recording. 5) for reamping you will need to send only the left DI signal back to the kemper. That means that instead of balancing it so that only the amp side is playing (by using the gain plugin), you balance it so that only the DI side is playing. Now you have a mono DI track. These are the settings that are shown in the picture I shared before. 6) So now, inside the daw, you can just play the DI track. Sounds horrible. We want to get it out of the DAW and into the kemper. 7) In order to maintain our gain staging, we keep the volume fader at zero. We also make sure that it is panned to the center - otherwise we are messing with the volume again. (yes, I said volume - remember, a pan control is essentially a combination of two mono FADERS, that can only take signal away from either one side or the other side). My screendump ERRONEOUSLY shows that the track was panned - this should NOT be the case! 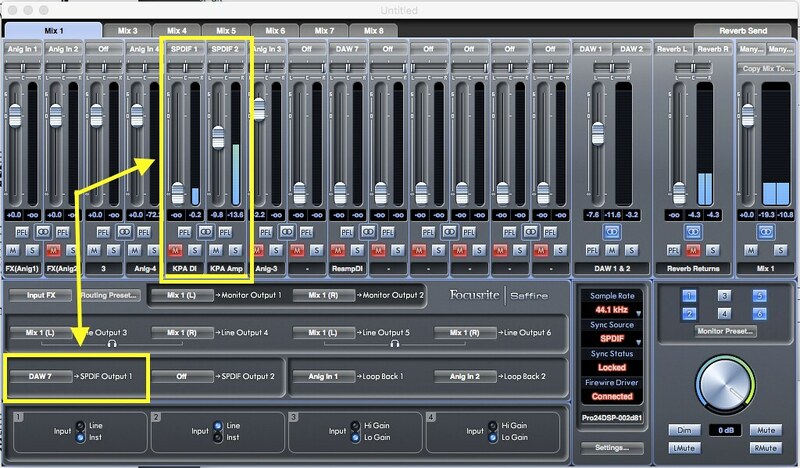 9) We set the track's channel output to do this; I use audio channels 7+8 to do this. I've given these a more descriptive name inside my DAW, but in reality, they are two "unnamed" audio pathways. They are actually arbitrary. It's just channels my interface is capable of receiving audio data on, from my DAW. Generally, channels 1+2 are used for the regular playback signal. I've chosen to use 7+8 for spdif output. 10) My interface tells my daw: "you can expect to RECEIVE signal on these INPUT channels: 1, 2, 3, 4, ..., X. These are all INPUT channels, and I don't care what you call them when you talk to the user. And I myself call them whatever I darn well please"
11) My interface also tells my DAW: "you are allowed to SEND signal to me on these channels: 1, 2, 3, 4, 5, ..., X. These are all OUTPUT channels, and I don't care what you call them when you talk to the user. And I myself call them whatever I darn well please"
12) The tricky part: the output channels in the DAW do NOT (necessarily) equate directly to corresponding physical outputs on the interface!! When the daw sends signal along, say, "output 3", it is essentially saying to the interface "here's some audio from MY "output 3" ". THE OUTPUT IS OUTPUT OF THE DAW - NOT OUTPUT ON THE INTERFACE!!!! Read that again. 13) points 10, 11 and 12 above have given me and many others much frustration and confusion! 14) So now the interface gets some audio from the DAW. WE MUST STILL TELL THE INTERFACE WHAT TO ACTUALLY DO WITH THAT AUDIO STREAM!!! 15) We want the interface to route that DAW output to one of the actual, physical outputs ON THE INTERFACE. In my case, the spdif output. 16) Look at point 9 again. The DAW sends audio along "some channels" called "7" and "8". 17) We want the interface to take the input from the DAW and funnel it to the Kemper via the PHYSICAL spdif output on the interface. This is done in the mixcontrol software, which is our "telephone line" to the interface - it's here we can tell it what to do with "stuff". - Mixcontrol has a number of "tabs"/pages, where you can set up different "mixes". These are labeled "mix 1", "mix 2" etc etc.. (by the way, The "Mix 1" tab is double wide, because it's a stereo mix. - These mixes are actually just like in a DAW - there are a number of channels, each of which has a fader, a pan control (horizontal slider above the fader), a solo button, a mute button, AND you can select which INPUT INTO THE INTERFACE is assigned to each fader. In my "Mix 1" in the screenshot, the first channel is assigned to my physical interface's "Analogue in 1", as can be seen by the label directly above the pan slider. You can also rename each CHANNEL in this mix panel, as can be seen below the Mute/Solo buttons on each channel. - Each of these INPUT channels can be assigned to any input into the interface, WHETHER IT BE FROM THE PHYSICAL INPUTS ON THE INTERFACE, OR FROM WHATEVER IS SENT THERE FROM THE DAW. The latter kind of inputs are called "DAW 1", "DAW 2", etc. - We are on the page called "Mix 1", which is - on my setup - routed to the PHYSICAL outputs 1 and 2 on my interface (Left and Right). These physical outputs are routed to my monitors and headphones. - This means that whatever the faders and solo/mute buttons are set to, and whatever these faders are assigned to (like "Analogue in 1") controls what is being sent out of my monitors. - "Daw 1" and "Daw 2" is what is being played back by my computer (inside my DAW, the "default" outputs of the master fader is called "Output 1-2" - which corresponds to DAW1 and2 in my mix control. - I use all the faders to set the right balance between playback from my daw (DAW 1+2) and whatever I want to hear from the interface's physical inputs in the headphones while tracking. So, when I want to track guitar, I want to hear it clearly, but not overpowering the bass and drums playing back from my DAW. So I make sure that the mix control fader corresponding to that physical input is set at a level where things are balanced. - See the top yellow square: Here, there are two tracks. In the top of each channel, these are set to correspond to the two spdif channels of the physical spdif input on the interface. Because I want to hear those while tracking. Actually, I only want to hear the AMP signal, not the DI signal - so I've muted the DI channel. THIS DOES NOT MEAN THAT THE DI DOESN*T GO TO THE DAW; IT DOES! IT JUST MEANS THAT THE DI IS NOT PART OF THE SUBMIX CALLED MIX1 - WHICH IS ROUTED TO THE MONIOTR OUTPUTS. I've also panned the amp track center, because I want to hear it in "the middle" while tracking. The lower square is where it happens. 18) Remember the channels FROM the DAW TO the INTERFACE are called "Daw 1" , "DAW 2" etc? And that we in step 9) said that I set the output of the track I want to reamp to "output 7"? This then is "DAW 7" as far as mix control is concerned. 19) so what we need to do is tell the mixcontrol software: "Hey, funnel your incoming "DAW 7" audio into the physical SPDIF output, so it goes to the kemper". 20) That's what is done in that yellow square. 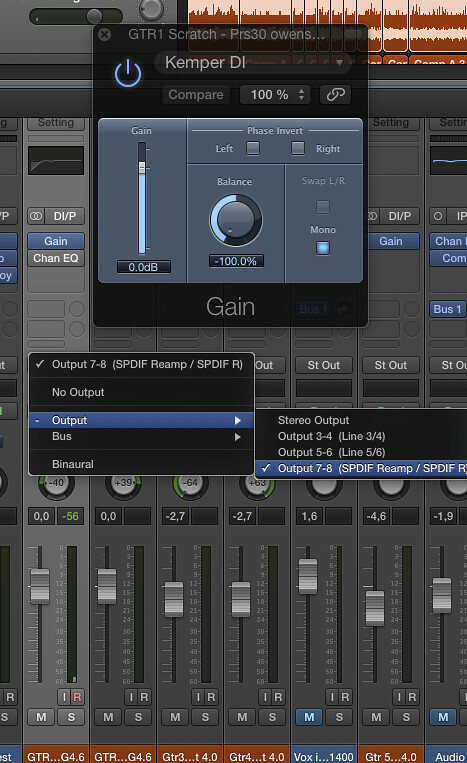 Simply click the button to the left of " -> SPDIF Output 1", and select "DAW 7". 21) Now, when you playback in your DAW, it goes to the Kemper. It's a bit convoluted, but this is the basic signal flow. Writing this out, I think my setup can be slightly simplified - maybe. But the general idea is still right. I hope all this made some kind of sense?? Thanks for posting this AND being so good about following up with me on the questions. Going to retry all this and see if I can make it work. Just forgot to mention that you have to either switch S/PDIF Out to Master Stereo on the Profiler to record the wet stereo signal ... or without switching just record the right (mono) 'Stack' channel to get the 'dry' reamped signal. Having said that, Michael's great explanation of how to route signals both around your DAW and via Mix Control appears to cover the entire process very nicely and the video lightbox has posted is also pretty handy! The MixControl is a little bit of a beast to get around, and requires some thinking and reading (due to its functionality - It's not complicated for no reason :-)). I thought I'd give an in-depth rundown of the connections between the interface, the mixcontrol and the daw, and how it all relates. I think the problems people are having is basically due to a lack of understanding of what it actually IS, rather than any problems with the product itself - hence my post. Very helpful info, I'll soon be revisiting this topic when the S/PDIF cables arrive. I never got around to doing this but we close on our new home next week and studio redo will be in full swing. I am contemplating moving to the Focusrite Claret8. Does it use the same MixControl? I believe it uses a different program. I would imagine there are more similarities than differences apart from the visual aspect, but I really have no idea. Before, I was using two Cubase tracks, one stereo for LR and one mono for DI. Well that's a huge pain as soon as you start editing. Now, it's just like editing a stereo track, except it has the "code behind" (as software nerds say) along with it. Thanks so much for this post. I am using the 2nd Gen Focusrite Scarlet 6i6, which uses the newer "Focusrite Control" software. So the details are different, but reading through the concepts in this post helped me to understand what I was doing, and I was able to use that understanding to figure out how to set up my routing with the newer software. Great post Michael_dk! This is exactly what I want to achive in my little home-setup. But I'm in Cubase and don't have access to the plugin 'Gain'. Do you know if there's a similar functioning plugin out there that I could buy?